Yes says they deliver a mobile 4G experience. With this notion in mind, took our Yes Go on a road test in KL and we’ve taken it on a road test in PJ. From our findings, both tests produced consistent results. 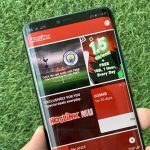 The Yes network is indeed capable of delivering mobile data services but there are several gaps in its coverage that we hope Yes can cover quickly to deliver true seamless mobility broadband. Having said that and considering the fact that Yes is a new network, we were mightily impressed by the extent of the network coverage so far as well as the speeds that we were able to achieve during the previous two road tests. So things are looking peachy for this new network but we’ll have to keep reminding you this is still a new network with a relatively smaller load on it compared to the more established players. We’ve heard so many times before that Malaysians don’t mind paying for their Internet so long as it is consistent and reliable. This looks to be an opportunity in which YTL can capitalise on. There is no secret formula to being a successful Internet service provider, all they need to deliver is consistency. As we’ve been enjoying very good speeds on the Yes network, we hope Yes is able to keep this speed consistent even as the network gets loaded up with subscribers. If they can, then there’s really nothing to hold Yes back in winning the hearts and wallets of Malaysians. So back to our topic of discussion. We’ve shared with you our findings on the performance — both in terms of mobility and speed — of the Yes network in certain areas in the Klang Valley, the question now is how does Yes perform outside Klang Valley? It’s common sense for telcos to focus the bulk of their network resource towards market centres and high densitiy areas. This means more that often than not, outlying rural areas are not as well covered as it should be. At launch Yes boasts a population coverage of 65% deploying over 1,000 base stations throughout the country. This is more than its current 4G competitor P1 which currently claim around 40% population coverage with under 900 base stations currently being deployed. All this is fine and dandy but right now what we want to know is where exactly in the populated areas is the 65% coverage focused on. Can Yes deliver consistent connectivity outside city centres? 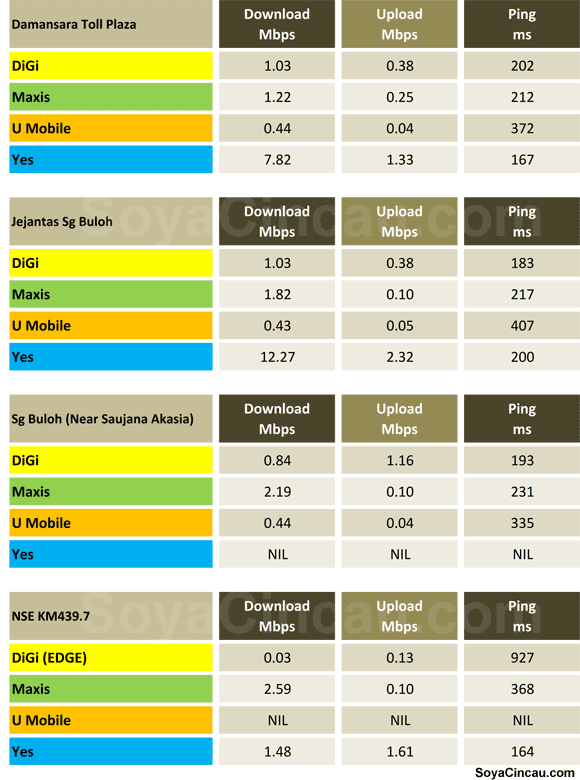 How is the network performance in areas outside of KL? 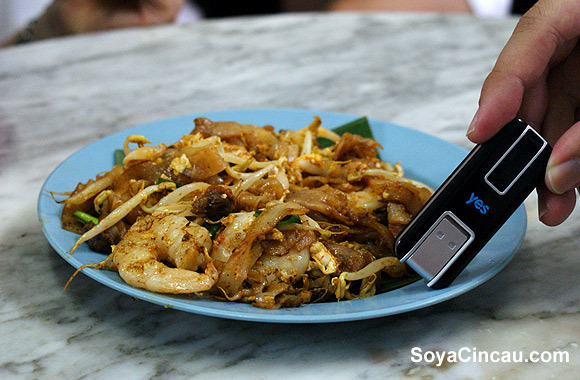 To find out, we took our trusty Yes Go along with USB modems and SIMs from DiGi, Maxis and U Mobile and hit the road up north to Penang for a mega road test shootout. On the way, we also wanted to find out if the Yes network has indeed got most of the North-South expressway covered. Initially their map showed coverage blanketing most parts of the highway however a day before our trip, we found out that the map has been “updated” revealing a completely different coverage map with much less areas covered. This got us contemplating if we should carry on with the test as it looks like there is no coverage on our route, but with the understanding that sometimes coverage maps can be inaccurate, we continued with the test anyway. We connected the three SIM cards (DiGi, Maxis, U Mobile) to separate laptops using USB dongles. For Yes, we used the Yes Go USB dongle that is connected to another laptop. So in total we have four laptops running all along our journey up to Penang. All along the trip, we did speed tests for all the connections at regular intervals — between 3km to 5km or as close to it as possible. Where we can, we conducted some streaming tests by downloading test files and videos from YouTube to see if we can stay connected and complete a download. In Penang, we added P1 into our test regime to see how it would compare with Yes on the island. For P1, we used the original W1GGY USB dongle at it is connected to another laptop. 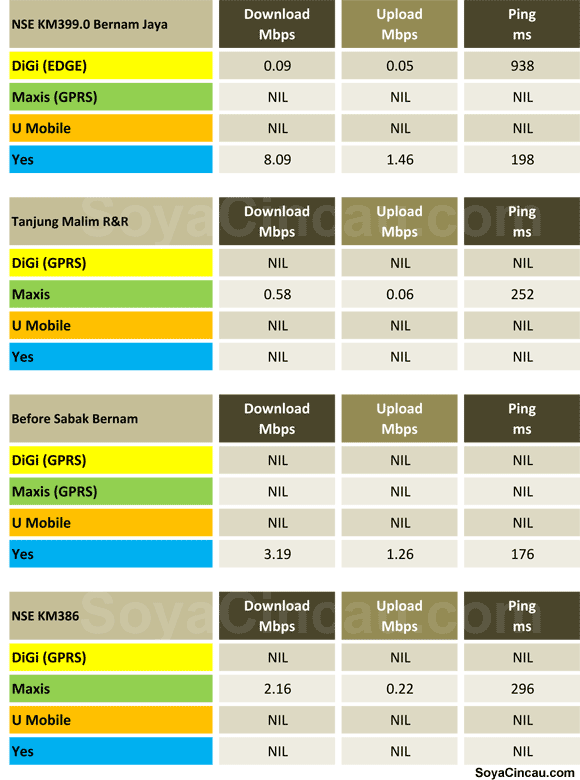 Note: We left out Celcom because we don’t have enough equipment to test five operators simultaneously. 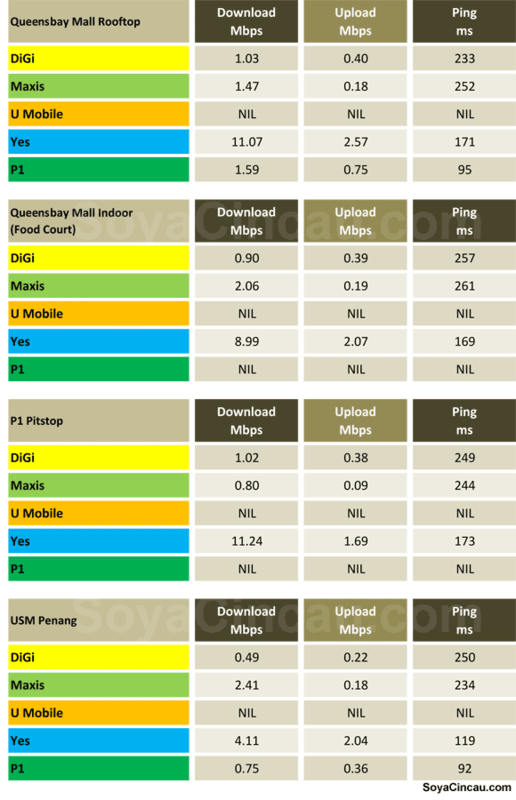 In addition, we felt Celcom’s broadband network to be below par when compared against the rest in this test (sorry Celcom). Also, we didn’t include P1 on the drive up to Penang because its network is not capable of delivering mobility and hence we were not able to get connected while moving. Now it’s on to the test. We entered the North South highway from the Damansara Exit on the Sprint highway and started our speed tests (DiGi, Maxis, U Mobile and Yes simultaneously) right after the toll booth. At the toll plaza, we got speeds of 7.8Mbps download from Yes while the DiGi and Maxis are holding up decently above 1Mbps. U Mobile on the other hand, showed a rather poor 440Kbps download speed, which was not what we expected as we usually get very good speeds on U Mobile. Along the way our early concerns of not being able to stay connected to the Yes network proved to be an issue as we passed the Jejantas Sungai Buloh rest stop. As we passed Saujana Akasia, we got disconnected from the Yes network due to lack of coverage. Despite this, we continued on with our speed tests traveling at an average speed of 110km/h occasionally peaking at 140km/h. Below are our results. As you can see, along our test route we were getting patchy connectivity from all operators. At no point during this route were we able to stream any videos or download files from any of the networks that we tested. This goes to show that although you can get some form of data connectivity on the North-South Expressway, you can’t really do anything much with it. But if we have to choose, from our experience during the test, Maxis delivered the most consistent speed and connectivity along the route. We were able to get connected on 3G and above at more places with Maxis than with any other operator. On the test we decided to stop-over in Ipoh to test the Yes coverage there as well. Approaching Ipoh we achieved the following results. As you can see coverage was patchy on the highway but right after we passed the Ipoh exit toll booth, we were able to get connectivity for all networks. Within Ipoh town we see the Yes network displaying the same trait as the previous two road test we’ve done in the Klang Valley. In most cases coverage is good. 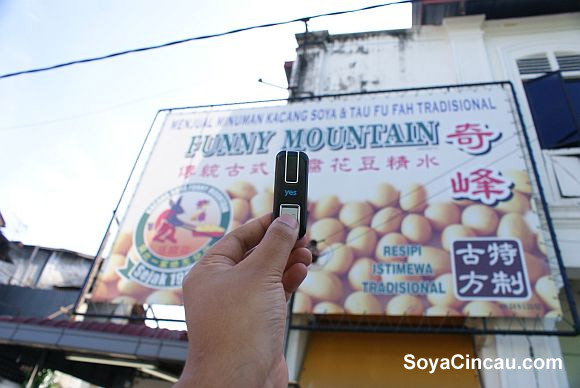 In all the popular areas around Ipoh we were able to get connected to the Yes network and even while on the move, we got good speeds. As expected in terms of performance, Yes blows everything else out of the water. 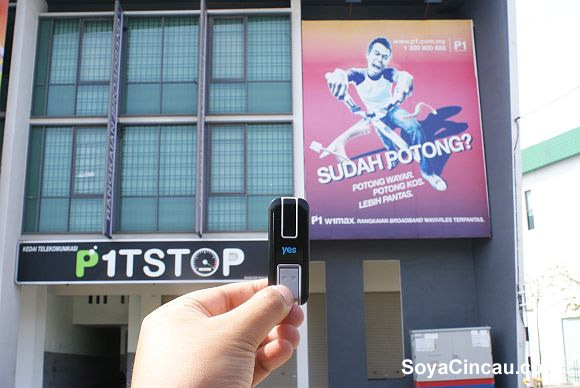 Some will be quick to point out that there are probably no subscribers in Ipoh and we will agree with you on that. So again we’re saying Yes needs to really make sure that they can maintain this level of performance because once people get used to this and it starts getting bad, then Yes will have a major problem on their hands. But for now we’re calling it as we see it. At time of our tests, the Yes performance is really good. We’re literally seeing cable broadband performance on a wireless network, albeit with higher latency. We hope to be able to revisit this test maybe 6 months down the line to see if there is any difference in performance. After Ipoh, it was non-stop to Penang. En route, connectivity was starting to get consistent and we were able to stay connected along longer stretches of the highway. This was where we conducted some streaming and download tests. Not surprisingly, Yes once again outshines all the other operators with fast download and smooth streaming even with 720p videos from YouTube. On the Penang bridge right at the midpoint, our Yes Go lost connection. 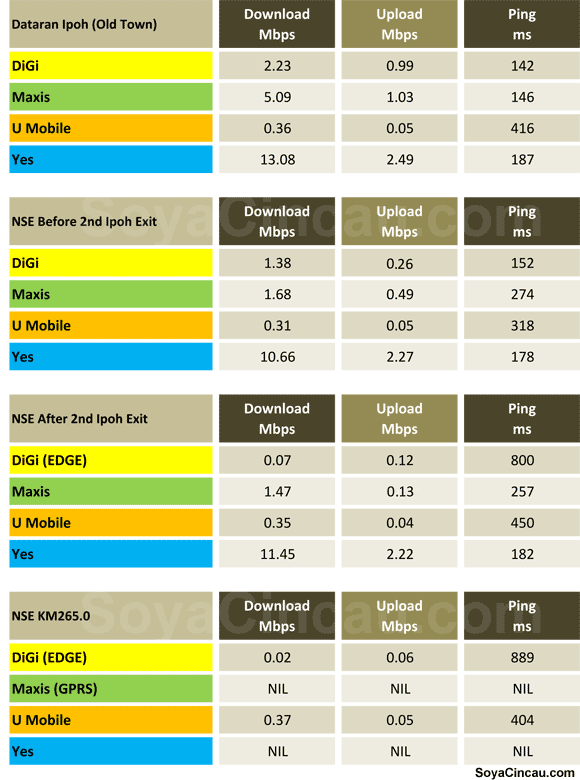 At the same time, our other test dongles on DiGi and Maxis too had dropped drastically in performance with both reverting to GPRS connectivity. About a couple of kilometres after the mid point, our Yes Go dongle picked up its connection again and we were able to get seamless connectivity from then on all the way to the Jelutong Expressway which, if you’re keeping track, is now called Tun Dr Lim Chong Eu Expressway in honour of the previous Penang Chief Minister. On the Jelutong Expressway however connection wasn’t consistent on the Yes network. We experience situations where the Yes Go connection manager will show that we’re able to pick up good signal (full bar) and we’re connected but we were not able to send or receive any data, we couldn’t open any web pages and we were not able to ping any IP addresses. This was very pronounced as we neared Tesco along the expressway but we wouldn’t be too concerned about this as it appears to be an an isolated problem as we were able to get good connectivity and performance throughout the island. As we were on the island we initiated the second part of our test — to compare head-to-head the performance of two 4G operators, P1 and Yes. For P1 we used the original W1GGY connected to a separate laptop to conduct our test. Before we even begin testing we note that Yes trumps P1 in terms coverage available on the island. It is worth noting that P1 has a good 2 year lead over Yes to expand its coverage but in our tests, it appears that the Yes Go is the more usable modem. Anywhere that we went on the island, we were able to get connectivity even indoors. In one instance while in our hotel room we were not able to get data coverage with all our other broadband services except for Yes and it delivered really good speeds, we were streaming Internet radio all night without a hitch. This really impressed us. During our various drive tests around Penang it was evident that P1’s coverage was spotty compared to Yes. In addition when we initiated mobility tests we noticed that the P1 W1GGY was not able to maintain connectivity while we were moving to the point where it got really frustrating. 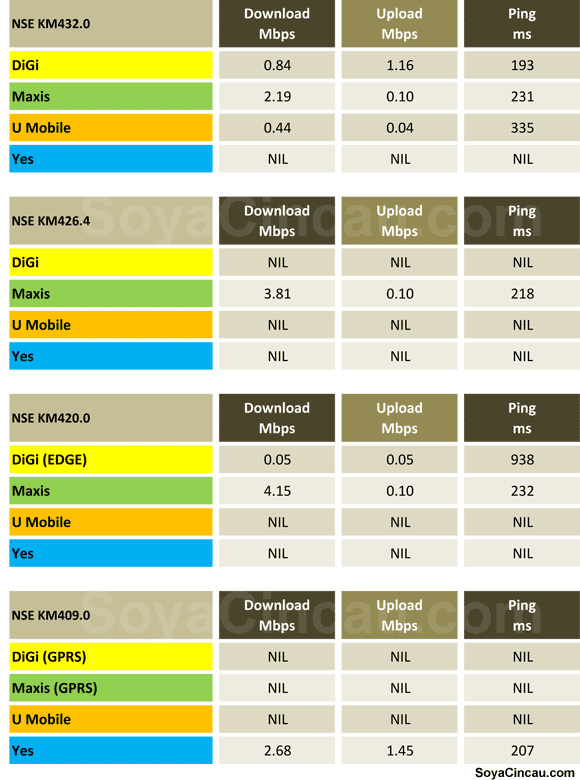 We compared the connectivity performance of both 4G dongles and in all instances we noted that the Yes Go was able to detect its network and get connected faster than the P1 W1GGY. Despite this we still wanted to get some solid performance numbers for P1. So we limited our route within areas where we could get P1 connectivity. From our tests, P1 ‘s performance was rather erratic. In some places we managed to get 2Mbps but in most cases we got frustrated trying to open a web page. Ping test shows that we are connected to the P1 network but we were not able to get anything done. We were very disappointed with P1’s performance in this test, we just couldn’t get it to work. After a few failed attempts and poor performance in various locations, we decided to drop P1 from the test regime as we couldn’t get any form of results. Despite our difficulty to get connected to the P1 network, we note that it offers the lowest ping of all. In all instances, we got less than 100ms for P1 while the rest hovers between 100-300ms range. 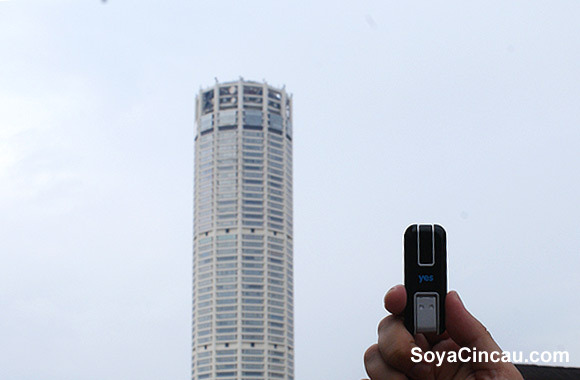 Overall we can say that the state of wireless connectivity in Penang is rather good. 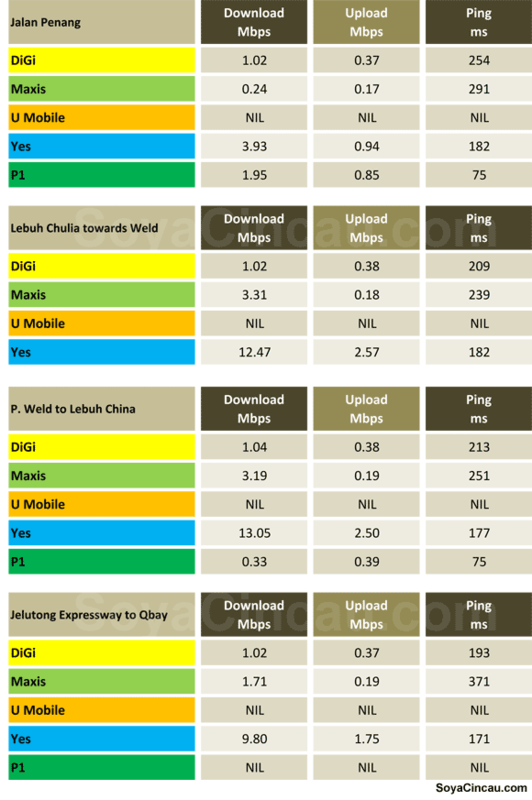 During our drive tests we got good speeds from DiGi and Maxis but as before, the speeds we got from the 3G operators is nothing compared the numbers we got from Yes. To make the most of our time in Penang we made as many drive tests as possible around Penang town. 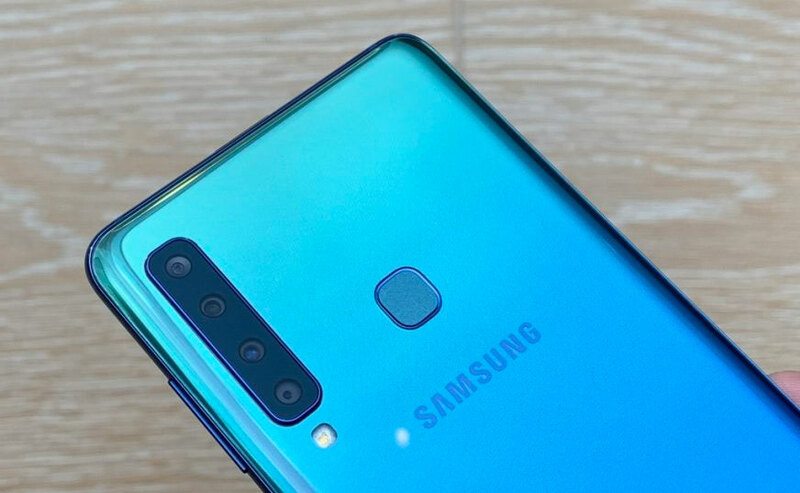 In this instance we focused more on the streaming performance of the wireless connection. While in some areas we could get smooth YouTube streaming with Maxis, Yes managed to do one better with smooth 720p in all the areas that we’ve tested. Below are the final set of results we got from our drive tests in Penang. We would like to point out that we even tested the 4G networks indoors to see if we could get connectivity. For those who’ve used 4G before will attest to the fact that indoor performance of WiMAX is rather poor. 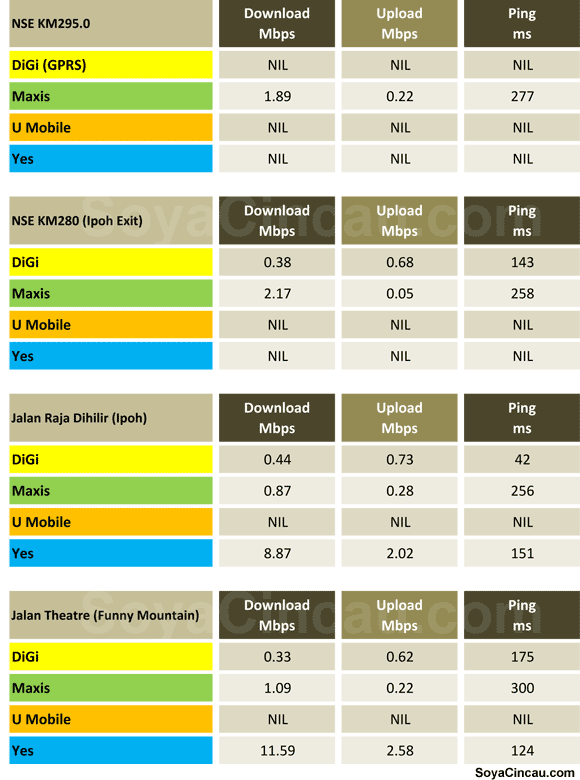 And so we didn’t expect much from Yes but it surprised us with good performance despite 2 to 3 bar connectivity indoors while the 3G operators delivered average performance and P1 simply faltered. So what conclusion can we derive from this test? In our opinion the drive test offered some revealing insights to the performance and coverage of wireless networks in the country. 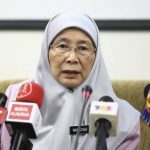 For one, we now know that be it the more established players like Maxis and DiGi or new players like Yes, no wireless network today offers seamless data connectivity on the North-South Expressway — the longest expressway in the country. 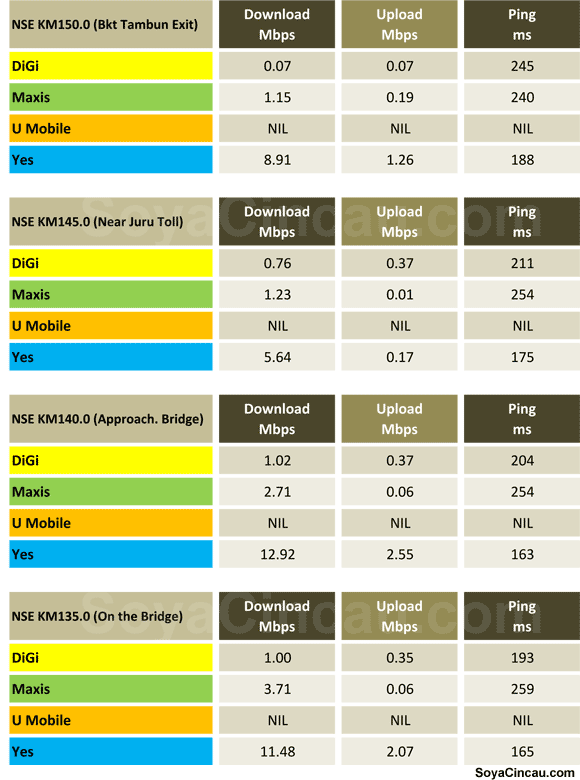 From the tests we also know that the most consistent performing wireless network on the expressway is Maxis. In our test, we could get usable data connectivity with Maxis in more places along the expressway than any other network but that is not saying a lot. 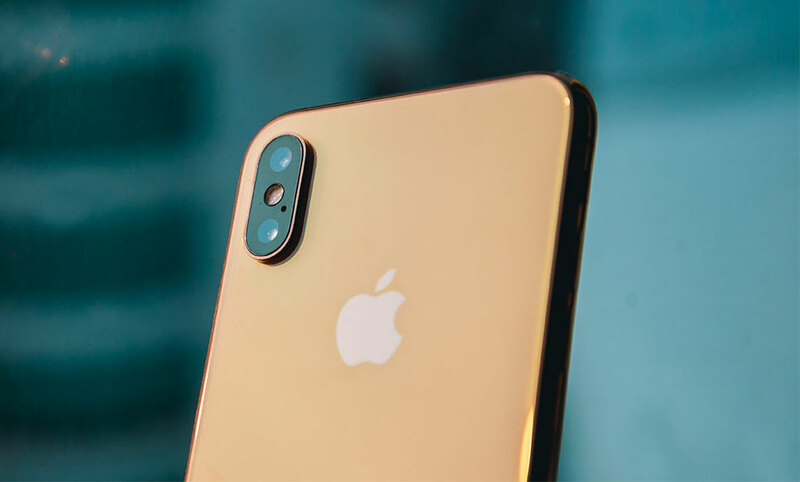 In most instances, we were left with GPRS connectivity on both DiGi and Maxis, so although you can stay in touch with phone calls and SMS, you can really do anything much online. And therein lies our biggest qualm with Yes. As a data network, Yes is amazing (for now at least), but as a mobile voice service, we have to say that the gaps in the Yes network is a deal breaker for us. Using Yes as a primary mobile voice line would mean that we will be unreachable often if we were to travel outstation regularly. 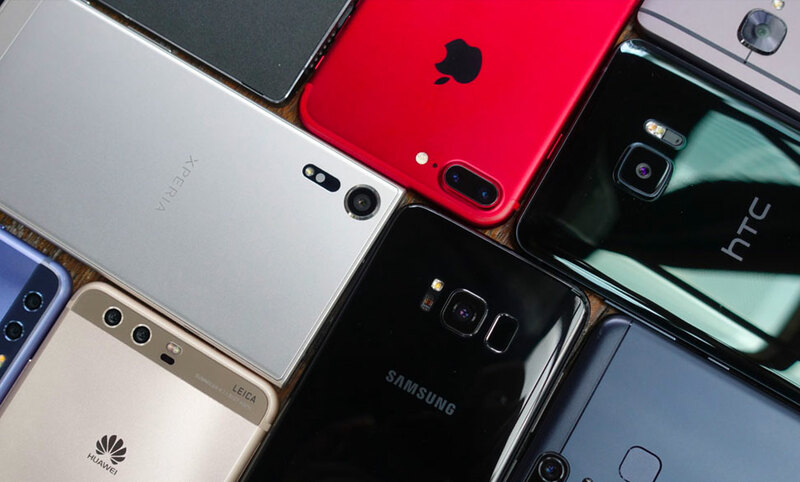 Mobile users use voice and data services differently and while we can forgive patchy data coverage, there is absolutely no excuse for a wireless operator to not be able to get a voice call or SMS across. Granted, people use voice less and less nowadays but it is an aspect that Yes needs to look into and address quickly for it to be able to properly complete with the 3G boys. But here’s the thing, the Yes network is still new and for a new network the span of its coverage is nothing to sneeze at. Some may argue that Yes was late coming into the game so the additional coverage is a given but we don’t think that is a fair assumption. 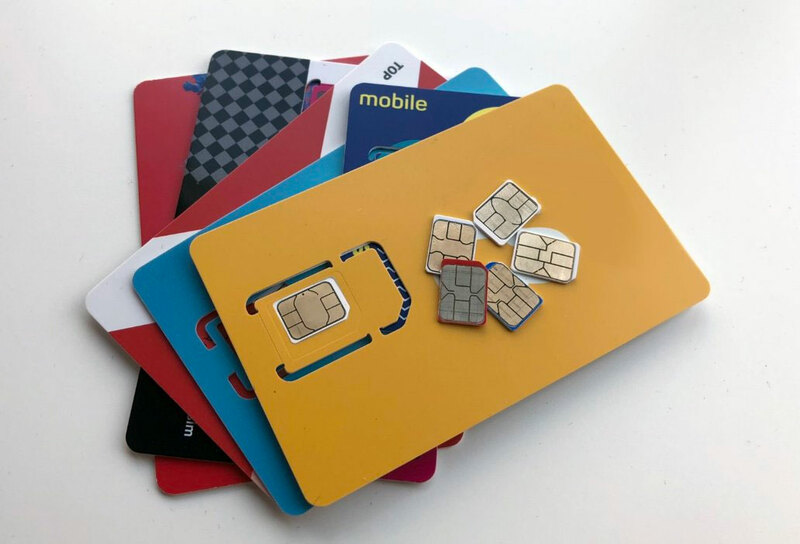 U Mobile, DiGi and P1 all launched their networks much earlier than Yes but all have smaller data coverage compared to Yes as our test reveals. What about P1? From a respected name at the forefront of WiMAX and 4G, P1 now has a mountain to climb to win the hearts of Malaysians. We’ll be honest with you, we were once P1 subscribers but the service started to deteriorate so badly that we chose to take our money elsewhere. 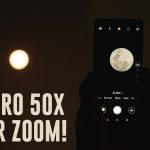 Michael Lai needs to get his head out of the gimmicky and downright silly marketing fluff and focus on bringing back the network from the brink. But that is just our opinion, maybe the smart people running the show at P1 know better. Even if they do, the results of our test and the consumers’ perception of the brand seems to say otherwise. At the end of the day, despite the various issues that has been plaguing the newcomer from launch (some of which are still unresolved, like a very messy self-care portal), Yes has the most important thing done right and that is its network. As paying customers, we are now finding ourselves using Yes for data more often than we think we would. So much so that we’re contemplating of dropping our 3G data subscriptions for good. That is how much of an impact Yes has made on us. But before we make the jump, we need to know that Yes will maintain the ferocious pace in which its network is growing and more importantly, we need the reassurance that Yes can consistently deliver this amazing performance that got us hooked in the first place. This reassurance is something only time can provide but it is up to the people at Yes to make the period in which the all important customer trust and confidence is build a very short period indeed.